Sony like rival makers continue to miniaturize models and the new A5000 is the smallest and lightest at just 9.4 oz (269g) with the battery in the maker’s current line up. At $499 including the 16-50mm collapsible kit zoom it’s a modestly priced model that may appeal to enthusiasts on a budget. Housed inside the compact form factor is a 20-Mpix APS-C CMOS sensor along with the firm’s Bionz X level processor which is capable of boosting sensitivity up to ISO16,000 and capturing Full HD video at up 50/60fps. A 3.5 fps burst rate is a little pedestrian compared to the 10 fps of the NEX-5T or NEX-6 but this isn’t quite aimed at the same audience. Nevertheless, while it lacks some high-end features such as Hybrid AF and the additional versatility of the Multi-Interface shoe, it has a useful 3.0” tilting LCD monitor (albeit just 460k-dot) and built-in WiFi with NFC connectivity for both convenient sharing and image capture. The A5000 was the first new model to eschew the NEX moniker in favor of the Alpha branding but it’s compatible with a steadily expanding line-up of lenses from the firm, currently standing at 22 when including the full-frame FE models, or 26 with the current Sigma DN and Tamron models. We’ve tested the optical quality of over 20 different lenses on the camera to see which of those models best suit your needs and which, if any, you should try to avoid. 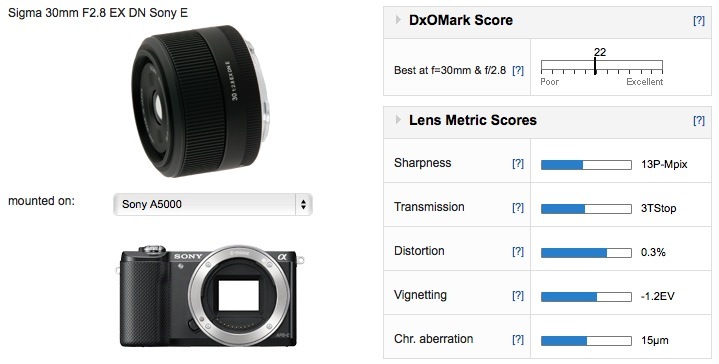 With a DxOMark lens score of 26, the best-performing model on the Sony A5000 is the Sony made Zeiss branded Sonnar T* 55mm f1.8 ZA. As full-frame lens it’s the equivalent of a 85mm short telephoto on the cropped body of the A5000 and at $1,000 it’s somewhat at odds with the accessibly priced body. If the high-speed aperture isn’t essential, the new Art-series Sigma 60mm f2.8 DN A model at $239 may be a tempting alternative. It has corner-to-corner sharpness from the initial aperture, low vignetting and excellent control of chromatic aberration. 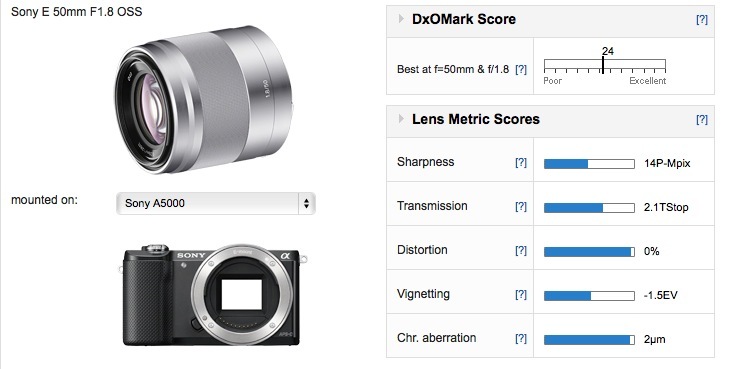 In third place is the Sony E 50mm f1.8 OSS a stabilized model the equivalent to a 77mm on the A5000. It lacks the corner sharpness of the Sigma or Zeiss and can’t quite match the peak sharpness either but it’s a good balance between features, price and performance. As for short focal lengths, the Sigma 30mm f2.8 DN models stand out, although, surprisingly, the newer Art series revamp of the earlier EX version isn’t quite as good a performer, despite the maker’s claims that the optical construction is unaltered. Sony’s 35mm f1.8 is another strong performer yet at $450 it’s a slightly pricey option for the gains in lens speed. Of the two Sigma 30mm f2.8 DN models in our database the earlier EX model is the better performer, although it’s unlikely now to be available on dealer’s shelves. We still rate the Art-series revamp though and at just a shade under $200 it’s a bargain. Although the maximum aperture is only modest of course it’s entirely useable with only a slight softening detected in the outer field. Stopping down doesn’t noticeably increase sharpness or uniformity, although in the lab optimum performance is achieved at f5.6 on the A5000. Diffraction isn’t really an issue till f11 and so the Sigma has a wide-range of useable apertures whereby stopping down really only increases depth-of-field which is useful characteristic in a lens like this. The only real weakness is higher than expected chromatic aberration across the image field at all apertures though this can be corrected for in some degree either in-camera or through software when shooting Raw files. Our short telephoto of choice is the Sony E 50mm f1.8. Although it has a slightly wider field of view than the Zeiss 55mm or the Sigma 60mm the combination of high-speed f1.8 maximum aperture and optical stabilization is extremely attractive. At around $300 the price seems justifiable in light of the features and performance. It has very good center sharpness wide open and while the corners never quite match the centers stopped down, it would be almost impossible to tell the difference at f8. Also the lens stands out for its extremely low chromatic aberration, effectively zero distortion and relatively low vignetting. 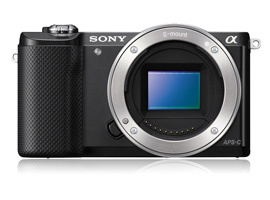 If you have a Sony A5000 and a favorite lens, we would very much like to hear from you. Please leave a comment below, stating what lens it is and why you like it.